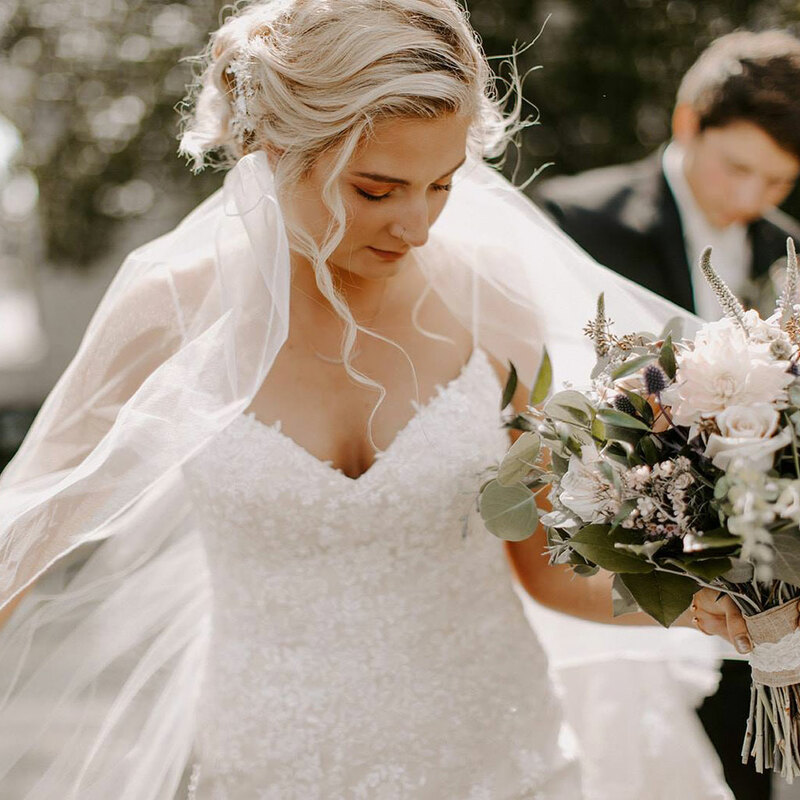 From A-line gowns meant for a princess, to fashion-forward numbers straight from the runway, find inspiration for your dream dress from these real brides wearing Maggie Sottero Designs. Caitlyn crafted a bridal style for the ages, with this timeless Nola gown. “I loved wearing my Nola dress, I cried when I had to take it off in the evening. Maybe I’ll pull a skit from F.R.I.E.N.D.S and drink wine on my couch with my girl friends wearing it!” Caitlyn joked. Gabrielle looked effervescent in this A-line gown, with an illusion neckline and tulle skirt. The crystal belt gives Gabrielle’s dress that extra fashion moment. Katie’s Winifred gown is the perfect option for brides wanting to show some skin, yet cover up. With an illusion high-neckline and fitted skirt, this gown is the epitome of elevated fashion. This swoon-worthy gown offers a fit-and-flare skirt, and a deep-v neckline. Sahar stuns in the Amelie gown, which offers a gorgeous, intricate illusion neckline. The full, ruffled skirt gives some added romance to the whimsical, beautiful gown. All-over lace and a sweetheart neckline update a classic, timeless gown. Alex wowed her then husband-to-be with a striking gown featuring an intricate, beaded bodice. An universally flattering shape, the circle skirt on this gown creates a killer A-line silhouette.